A remarkably coordinated dance performance. 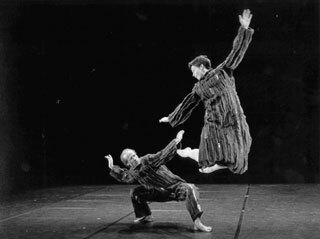 Nearly every sound and each subtle modulation are being reflected on the dancers’ movements with unusual synchronicity. Or is it rather vice versa? As if not only the music but also the stage lighting and the video were somehow pre apprehended by the dancers. A piece innumerably rehearsed? A congenial collaboration between the composer, the choreographer, the video artist and the dancers? All possible, but curiously the hi-tech stage sometimes seems even to closely follow and react to the finest stirs of the human body. Not only steps or gross choreography but also breathing frequencies, hardly noticeable muscle tensions and elusive body contacts seem to be depicted in the multimedia space. Then again, at certain irregular times the acoustic and the visual impulses are obviously playing an input role, so the human body and mind still react as if in a “traditional” way: the image on the screen and the melody strike the dancer with their form and meaning. And even if somehow self-composed by their own bodily movements, the musical score nevertheless seems to leave a trace in his and her movements. For a moment the dancers look as if they were shadowing their own visual reflections on stage or trying to dance to the musical echo of their own movements in a kind of self-reflective loop. The speechless dialogue between the two bodies unveils a third, intensely present communicative party - the interactive electronic space. A typical evening with “Palindrome IMPG,” permeated with an intensive and strikingly concrete communication between body and space, between man and machine. So how come that blinking of an eye and of a spotlight have never been so simultaneous before? Sometimes man is merely too stubborn in using his tools only for what they were initially meant to be good for. Palindrome’s stage is under the surveillance of (simple video) cameras that report every smallest change of pixel value, every single shift of hue or shadow line to the computer. The barely reverse-engineered bio sensors (from the local store) measure muscular tension, heartbeat or skin moisture that, after passing a computer or two, begin texturing a video image or granulating a tonal sequence, possibly picking a set of files from a data base and rearranging them before output. Or even give a cue to a musician or video artist performing live. All of this is done not randomly, by way of a mere special effect, but rather as a pointed, highly conceptualised and aesthetical frame: for example all based on a text by Rainer Maria Rilke as in the 2001 award winning “Seine hohle Form…”. Now also the programmers, musicians and even composers can take part in a dance performance, add some of their own flavour in real time and engage in a collective multimedia jam. Of course, Palindrome are not the only prominent dance performance group using interactive systems and complex media set-ups as vital parts of their events (c. f. Troika Ranch, Company in Space, AlienNation). Yet they may be one of the few that actually encourage audience participation, be it games and simple choreographing during intermissions or guided explorations of the interactive stage after the performance. As an interdisciplinary oriented “Inter Media Performance Group” Palindrome themselves developed a comparatively flexible and intuitive interactive System “EyeCon” that they use in all of their performances as well as share and collaborate on with others in workshops, recently even within a university education program. The dancers and the audience can work together on bringing about a fulfilling event. And so can different machines: according to Palindrome the only way to optimise the multimedia set-up in “Seine hohle Form…” was to make a PC and a MAC work closely together, though on video and audio data respectively. Ever since we have trusted our naturally (aurally, visually, olfactory) extended bodies as media of communication in concrete, local spaces. Now they are increasingly being extended and complemented through digitalised pictures, sounds and even mechanised “secondary” sensory channels (data gloves, smell-synthesizers) of an electronic space — together with both, its controllability and its unpredictability. A globally extended communicative presence adds up to an — often hardly bearable and therefore artistically/pedagogically relevant — condition of glocally mixed realities. For decades the performance as well as installation art that invokes the concrete body-in-electronic-space has been proving a culturally significant context for (verbal) comments as well as (corporeal) experiments on the rapidly changing technological and thus communicative condition. From Mail- to NetArt, from closed circuit installation to multimedia performance man has dysfunctional, yet always rewired the everyday media to something unusual that made him think again — and create on. Therefore body-machines as well as machine-bodies should not only be let to peacefully coexist, but must be encouraged to develop cooperative productivity, especially at times and places where their complexities, codes and consciousnesses coalesce. Man’s constructions and dances can and should be alternated with the decisions and performances of the machine, especially as that may convince the man — physically or intellectually — to work/think over the machine twice before creating and/or using it. Yet still, all work and no play makes man a dull machinist. As if the above calls for letting go of the technophobic myths, since absolute control over the media technology has been lost quite some time ago and the wisest option may be to explore its (self)subversive and unspecific functions. With the advance of artificial intelligence that is gaining on a new, less mathematical and more concrete, organic-like complexity (a-life, wetware) the traditional human domain of concreativity (congenial creativity) must accept a new and equal player. Numeric and verbal simulation combined with locally well-informed machinery and global mappings (motion capturing/tracking, GPS) may even surpass man in spatial coordination of different media channels or data processing, but will nevertheless hardly jeopardise certain aesthetic, conceptual, and even corporeal domains. If at all, beauty can hardly be expressed in algorithms or pixel values and pleasing poetry machines as well as dancing robots are still rather projections than facts. If words and numbers are the traditional battlefield between man and machine, let body and space be their joint playground. There obviously exists codes that make different systems understand each other. And learning foreign languages has never been a wiser thing to do: more and more tools, hardware and software alike, are being made accessible and standardised for a broader, cross-cultural and inter professional use (open source, hardware workshops). The networked computer has become standard interface and every day medium of social (interpersonal) as well as self-reflective (intra personal) information processing. All of the essentially dissimilar parts of the new media trialogue between man, machine and electronic space have to repeatedly overcome their Babylonian condition. Media art and pedagogy should experience and educate man towards a fearless and yet playful, distanced and yet constructive dealing with his own technical creation beyond unnecessary dualism. An innovative exchange between the human body and its electronic, medial context takes place where the multimedia machine can not only abridge, but also enhance and enrich human interaction and communication. The kinaesthetic quality of a dance performance presented by Palindrome succeeds in gaining back the magic of a media art piece, just before getting critically questioned — or even lost — through necessary techno-logical demystifications. Within a supposed techno culture only sincere cooperation between man and machine, between their fairly shared interfaces and programs will be able to bring back the sense(s) that may have gotten lost in combat. Either from the beginning or from the end, Palindromes is always read the same. “Palindrome Inter.media Performance Group” are situated in Nürnberg, Germany (Homepage: www.palindrome.de). See also the video documentation of their performances at www.palindrome.de/video.htm. www.troikaranch.org, www.companyinspace.com, www.aliennationcompany.com is to name but a few. EyeCon: http://eyecon.palindrome.de; Workshop: www.palindrome.de/workshop.htm. This year members of Palindrome are establishing an MA course on “digital performance” at Doncaster College, UK: www.don.ac.uk/ipa. http://eyecon-model.pleter.net; as a part of the author’s PhD project this “hypermodelling” (exploratively enhanced graphic with interviews, pictures and video documentation) of EyeCon interactive system as used in “Seine hohle Form…”. German language. After oscillating between Slovenia and Germany for the last couple of years pETER Purg is now finishing his PhD on “Bodies in Interactive Electronic Spaces” at the Institute of Literature and Media in Erfurt, Germany (http://diss.pleter.net). Besides theoretical writings on the topics he rather practically engages in combinations of and concreations in multimedia, drumming and street performance as well as conducts digital literature workshops. For details check the website or email below. Lives in between Slovenia and Germany, completing his Ph.D.